After getting to Mile 0 of the Alaska Highway, I could either take a more direct route and drive through south-east Alberta and Saskatchewan or go a more scenic way. I will almost always take the scenic way. In this case though, it also made sense in that I would have be entering the US sooner and gas is cheaper in the US. The plan was to take Canadian highway 40 south out of Grand Prairie and connect with highway 16 by Jasper National Park. Highway 40 was a pretty drive - very wooded and hilly - but the oil and timber industries had a firm foothold. I spent the night at a Recreation Area and drove into Grand Cache in the morning. Aside from the big coal burning electric station outside of town, Grand Cache was a cute little town in a very scenic location. A little further south and I was entering Jasper... along with thousands of other people on this sunny and warm Labour Day. I had never entered the park from the northeast and the drive in on 16 was beautiful. When I visited this park several years ago, it was in late May and I had the place to myself. On that trip, I drove the 25km or so to Maligne Lake and saw 4 black bears, a couple of elk and bald eagles on the way. I had high hopes for wildlife sightings this time but, as soon as I saw the amount of traffic on the road, I was not so sure. I made the trek anyway and my suspicion was proven correct - no wildlife. The drive is still pretty though, with Medicine Bow Lake and Maligne Lake being the stars of the trip. I worked my way south on the Icefields Parkway and spent the night in the parking lot of the Icefields Parkway Discovery Centre. In Jasper, the skies were clear but as I drove through the rest of the park on the Bow River Valley Parkway, it was getting smokier and smokier. 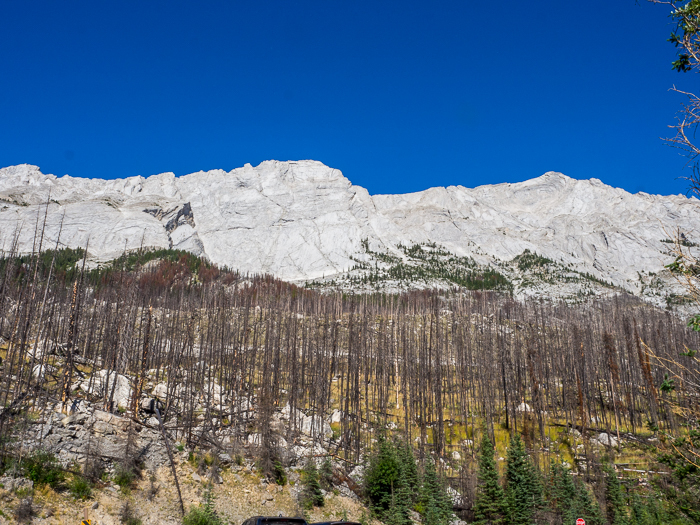 I checked with the Canmore Visitor Center to find out where the active fires were and saw that although there would be significant smoke on Highway 40 south of Banff, there were no fires threatening the road so that route was still the plan. Highway 40 in this part of the province is also called the Kananaskis Trail and the mountainous area is called Kananaskis Country. The first 20 miles or so south of Highway 1 is lovely, rolling ranch/farm land. The terrain then becomes more mountainous up to Kananaskis Village which is a popular ski area. The road is only open seasonally south of the village to allow for the abundant wildlife to be undisturbed during the winter and spring. Much of the area is protected as parkland and there are tons of campgrounds, trails and picnic sites that have been developed very thoughtfully to minimize their impact on the land. The drive was beautiful, even with the smoke, so I can imagine how stunning it would be on a clear day. The wildlife tends to hunker down in smoky areas so I didn't see any. I overnighted in a campground right on a lake - the smoke didn't allow me a clear view of it, but it did add an element of mystique. In the morning I took a short hike along the lake and then continued my journey south. I didn't mention earlier that my GPS was doing everything possible to avoid having me take highway 40 down this stretch and I can't imagine why. The road was in good shape and the foothills and mountains were gorgeous. But what really made me happy that I went rogue on my GPS was the wide variety of landscape I saw. As I was descending the mountains the vista started becoming more expansive with rolling ranch land and fewer trees. I stopped for breakfast in a really cute 'Old West' town called Longview which is located where Highway 40 and Highway 22 (The Cowboy Trail) intersect. I found out that the Clint Easwood movie Unforgiven was filmed in and around Longview so you can get the idea. I was continuing south on 22 en route to Waterton Lakes National Park and the land had flattened out to big sky country. I stumbled upon a Canadian National Historic Site called the Bar U Ranch and decided to check it out. It is a living history museum of sorts with one of the largest collections of original buildings in Canada. Founded in 1882 as the Northwest Cattle Company, the Bar U was one of the first and most enduring of the large corporate ranches established in southern Alberta. The ranch achieved international repute as a center of breeding excellence for cattle and purebred Percheron horses and was in operation until 1950. I continued on to Waterton Lakes and arrived just in time for them to tell me that an evacuation alert had just been issued. Most of the park was already closed but they let me in to see what little was still open. I was able to check out the Prince of Wales Hotel and National Historic Site and sort of see some of the lakes - some of which are the deepest in the Canadian Rockies. The park is part of the Waterton-Glacier International Peace Park which was formed with Glacier National Park in Montana in 1932 and was dedicated to world peace by Sir Charles Arthur Mander on behalf of Rotary International. It is only about an hour to the east side of Glacier National Park from Waterton Lakes so I decided to spend the night at St. Mary's campground there. The smoke was just as bad if not worse at Glacier and the Going to the Sun Road was closed at Logan Pass with the west side of the park getting destroyed by fire. Last time I was at Glacier it was also September but later in the month. On that trip I was only able to drive the Going to the Sun Road up to Logan Pass from the west due to snow so now I have seen the whole road - albeit at two separate times. Anyone who has been to Glacier and seen the view from Logan Pass would not even be able to recognize it from the photo above. The smoke was so thick that it was difficult to even discern that there were mountains out there. As I write this my heart is heavy with the evidence I have seen on this trip of the damages that are being done to our earth due to global warming. Rapidly melting glaciers, extreme drought and fires plus the terrible destruction being caused by hurricanes and flooding made seeing the human abuse of the land even harder to accept. As a glimmer of hope, I did see a small amount of renewable energy being generated in the form of wind and solar but it was small in comparison to the coal mining and burning, oil drilling, fracking, transporting and refining and damming of rivers doing irreparable damage to fish and other wildlife. I understand that it could be said that I am a hypocrite because I was out driving my gas powered van and I understand that but I am trying to live my life as mindfully and thoughtfully as I can when it comes to my role in perpetuating this harm to our planet.